The beach at Williamson Lake is a hot spot for cooling off for both locals and tourists alike. 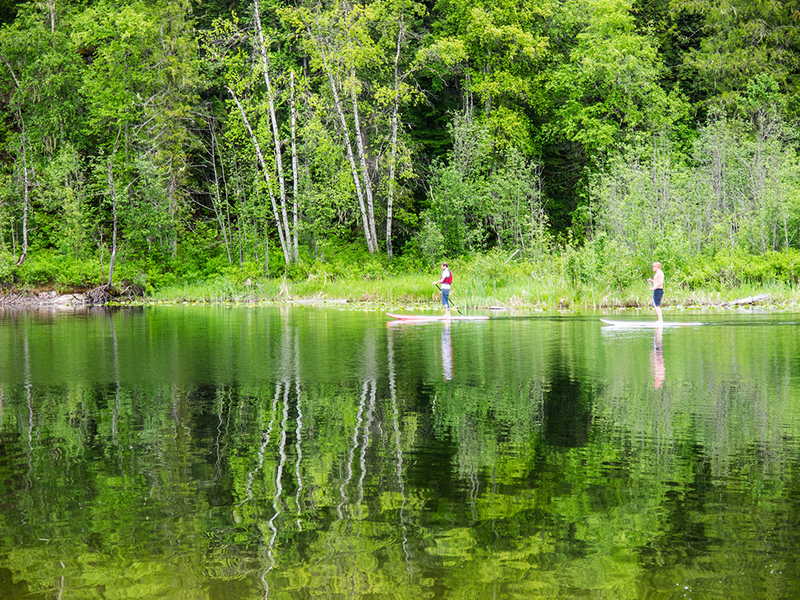 Williamson’s Lake is one of Revelstoke’s gems. On any given summer day you can find families fishing, couples paddleboarding, kids splashing around, and people of all stripes basking in the sun. Visitors love to camp by the warm waters, while for locals it’s the ultimate spot for family fun. Michael Shellnutt and Alicia Jackson have worked together at BC Parks for three years. Alicia, hails from Ontario and moved to Kelowna with her parents in 2004. In 2014, she moved to Revelstoke with her husband Dean, who was hired to manage the Revelstoke Golf Club. Their daughter was born here in 2015. With a love of camping and experience working for Saskatchewan Parks behind her, she worked at Martha Creek Provincial Park for two years before being named manager last summer. Michael has lived in Revelstoke since 2011. 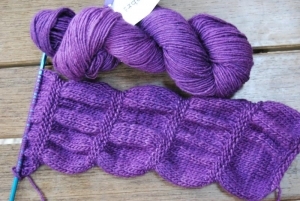 Also a native of Ontario, his story is classic of many younger Revelstokians – coming for winter, but staying because of the summers and the abundance of outdoor adventure possible here. 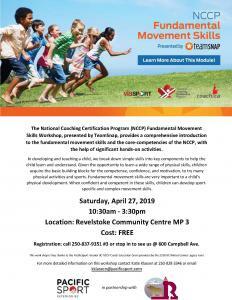 He met a local girl, started working at Blanket Creek Provincial Park and a few years later he was promoted to manager of Martha Creek Provincial Park. When Blanket Creek was expanded, he returned to operate the popular campground. Mike and Alicia met while working together at Martha Creek and they started Cedar & Spruce Consulting. When the opportunity arose to operate Williamson’s Lake they saw it as the natural evolution of their careers. “Williamson Lake is a very unique opportunity, where locals and foreigners get to experience just a tiny piece of what Revelstoke has to offer,” explained Alicia when asked what drew them to the park. Williamson Lake is stocked with fish every spring, making it a great spot for a family fishing outing. 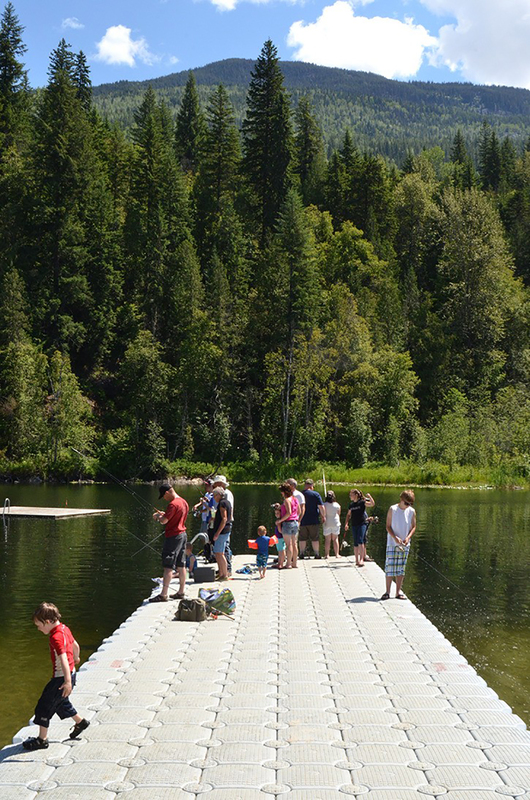 Families have been flocking to Williamson’s Lake since the 1890s, not long after Revelstoke was founded. 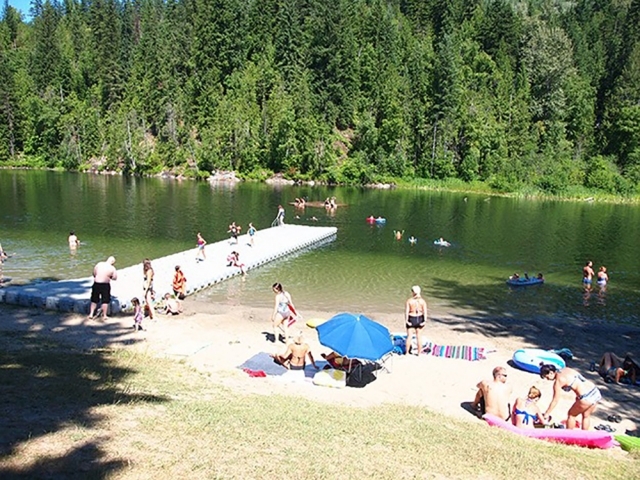 Named after local farmer Mr. A Williamson, it remained an undeveloped spot until 1930 when the newly-formed Revelstoke Rotary Club decided to pour their volunteer efforts into developing the area as a family-friendly park with a beach, docks, diving boards, and more. Almost 90 years later, Williamson’s Lake remains the swimming beach of choice in the area, its warm waters and proximity to town making it the perfect place to cool off on a hot day. Mike and Alicia recognize the history behind the campground and its significance to the community. 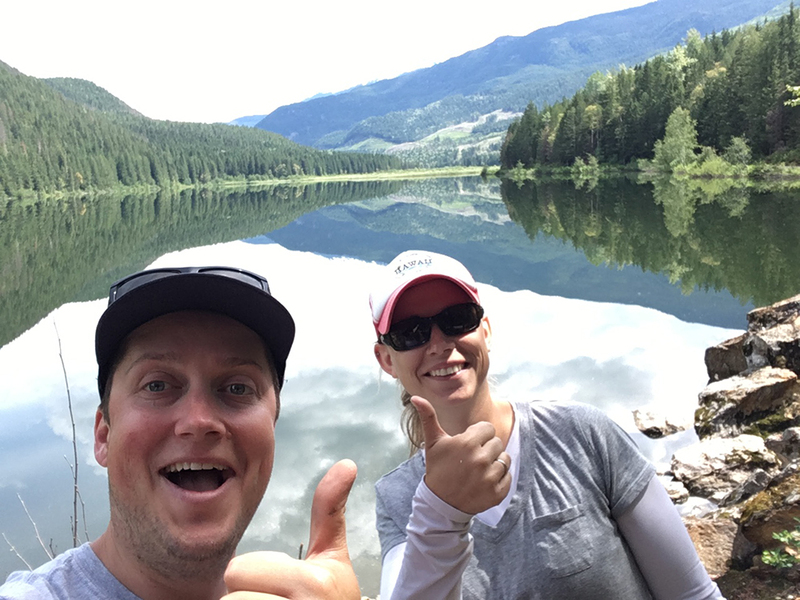 Working at BC Parks exposed Mike and Alicia to all aspects of running a campground, from maintaining the grounds and greeting campers, to the behind-the-scenes work that goes unnoticed. They’ve cleaned campsites, mowed the grass, and know what it means to be Bear Aware. For Alicia, the key to a good campground is friendly staff, reasonable privacy, clean and safe amenities, and a family-friendly atmosphere. Paddleboards and more will be available for rent at Williamson’s Lake this summer. They’ve been working hard to get things ready for the upcoming camping season. They’ve launched a new website and have begun taking bookings. The campground is set to open May 3 (earlier if possible) and they’re looking forward to running at full-capacity this summer and offering all the great amenities visitors are used to like paddleboard rentals and mini-golf. 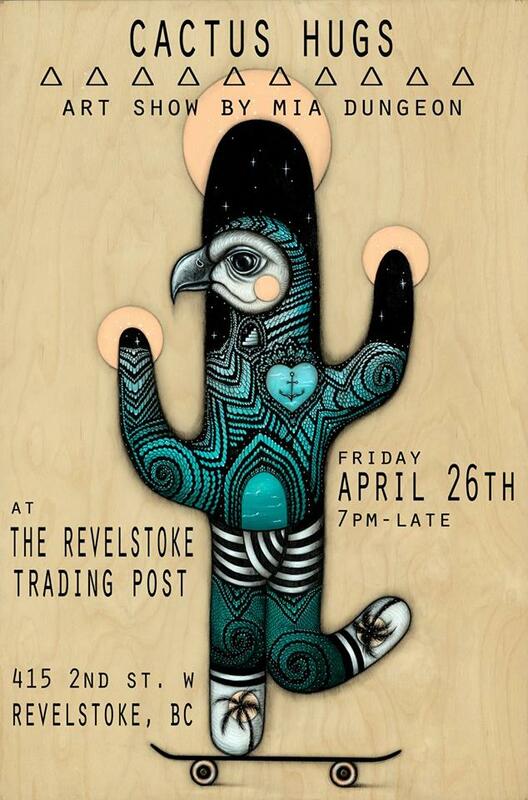 This is a sponsored post created for the Revelstoke Mountaineer.